He doesn't scream bloody murder when his speedy Spartans forget their mission. Instead, White Station coach Jesus Patino gives them reminders. Fresh reminders. Clinging to a three-point lead at the half, the Spartans went back to defensive basics and dominated the first 4 minutes of the second half en route to a 64-44 win over Moanalua last night on Day 2 of the Iolani Classic. Jordan Miller, a 6-foot-3 guard, led the Spartans of Memphis, Tenn., with 15 points. Marquette Murrell, a 6-6 center, added 12 points and controlled the paint as White Station (10-2) advanced to the quarterfinals. Erik Buggs also had 12 points, and Joe Jackson scored all 10 of his points in the first half. The Spartans will face host Iolani in today's 6:30 p.m. game. Moanalua was as close as 22-21 midway through the second quarter after Stevie Austin swished a pair of free throws. Na Menehune were within 32-29 at halftime. White Station used traps beyond midcourt and a suffocating halfcourt man-to-man defense to put a lid on Austin, who scored nine of his team-high 13 points in the first half. "Sometimes we get confused with being athletic," Patino said of his team's penchant for reaching and overplaying the passing lanes. "I told them (Moanalua) is well-coached and quick, but we had too much gambling." Focusing on Austin, who scored on a variety of twisting drives and jumpers, was a priority. "We quit gambling and took 11 (Austin) out of the game. Every time he handled the ball, he made something happen," Patino said. The Spartans' renewed defensive effort sparked a 13-3 run to open the second half. Buggs drained a trey from the top of the key and Murrell hustled for a tip-in as the Spartans took command. They pushed the ball upcourt effectively and led 45-32 with 3:40 left in the third quarter. The smaller Menehune got no closer than 13 the rest of the way. Rob Munoz added 10 points for Moanalua. White Station plays in the Memphis City League. "It's the toughest league in Tennessee and one of the toughest in the country," Patino said. "We're young and we just want to continue to improve." Brian Katz swished a couple of big 3-point shots as St. Dominic (N.Y.) broke open a close game early in the fourth quarter. The Bayhawks had a 38-35 lead entering the final quarter when Katz, a 6-3 junior, hit treys from the corner and the top of the key during a 12-0 run. St. Dominic, which used a 2-3 zone for much of the contest, switched to a tight man-to-man defense that bothered the Rams. Radford missed its first seven shot attempts of the fourth quarter before breaking its scoreless drought on Gary Satterwhite's short bank shot with 2 minutes left. St. Dominic (4-0), of the Catholic Nassau Suffolk League, will play LeFlore today in an 8 p.m. quarterfinal. Beau Albrechtson scored 22 points, including a pair of 3-pointers, to lead the Bulldogs over the Sabers in a consolation-bracket game of the Iolani Prep Classic. 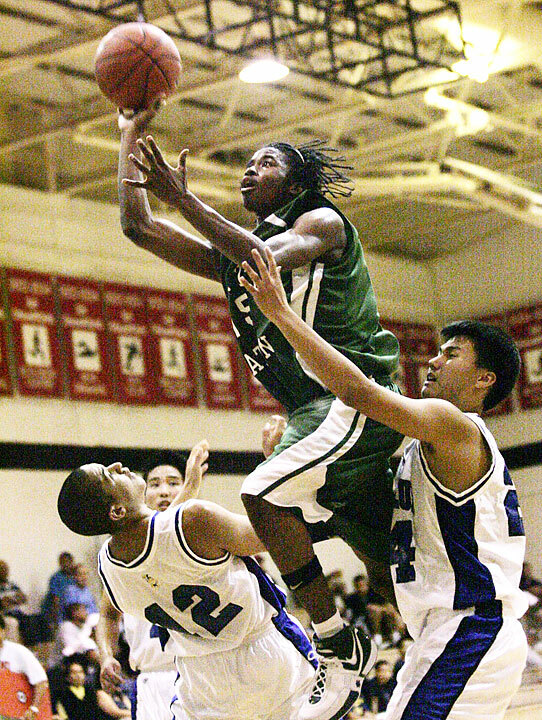 Ryan Kakitani added 12 points for Kaimuki, all from beyond the arc. Mike Makinano scored 14 points and Jayden DeLizo added 10 for Campbell. The Warriors' Mitchell Kauwelo led all scorers with 12 points and Rykin Enos added 11 for Kamehameha, which held off the Trojans with ease in a consolation-bracket victory. Curtis Murakami had a team-high seven points for Mililani, which trailed by 18 points at halftime. The host Raiders utilized a balanced attack to double up the Tigers in the opening-round game for both teams. Case Miyahira scored 14 points, Ryan Dung had 12 and Liloa Nobriga 11 for the Raiders. Nainoa Lessary and Isaac Iuta tied for team-high honors for McKinley with six points apiece. The Rattlers (13-0) used a smothering fullcourt press and relentless up-tempo offense to overwhelm the Crusaders in the late game. Nick Williams led the Rattlers with 20 points and Derrick Young tallied 19. Scott Smith led Saint Louis (3-2) with 16 points and Cole Shidaki added 12. Williams, a 6-5 forward, sank three treys in the opening quarter as LeFlore (Ala.), ranked 11th nationally by USA Today, raced to a 25-8 lead and never looked back.